The world’s biggest and most glamorous parade will get faster yet again next year, which will either be to the great relief or dismay of the poor souls having to run Honda engines. We’ll just have to find out. The revamp of technical regulations this year to make cars faster, more spectacular and harder to drive has delivered on its aim of cutting laptimes by around five seconds over 2015 levels. 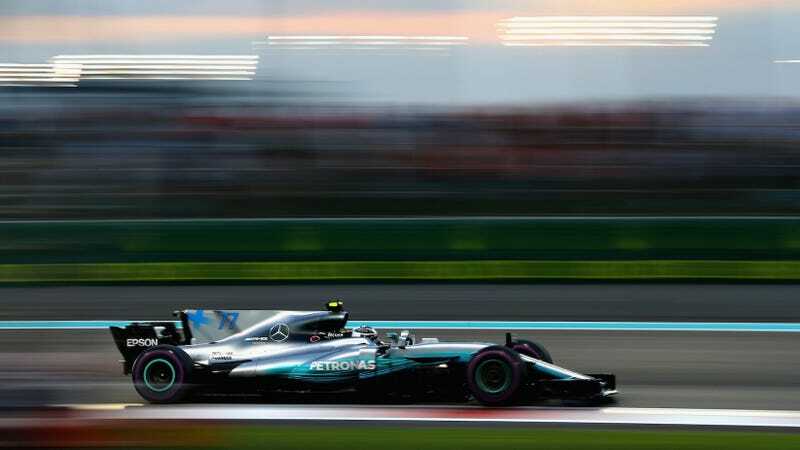 Every track saw an improvement in pace this year, with the peak being the Malaysian Grand Prix where Lewis Hamilton’s pole position time was nine seconds faster than two years ago – although factors like weather, the time of year and track resurfacing played their part. Although F1’s aero rules have delivered in allowing the step forward in form, teams’ understanding of the regulations is still relatively immature – which means there remain gains to be had. Next year won’t be all rainbows and happiness for lap times, though. With the addition of a giant but necessary flip-flop-shaped bar to the race cars—alright, it’s called a halo—comes extra weight, which means slower cars. The Force India’s team said the halo and its mounting can add up to around 31 pounds to the car, and that an additional 22 pounds can add around 0.3 seconds to a lap time depending on the race track, according to Motorsport.com. In a rough calculation based on that, 31 pounds would add more than 0.42 seconds a lap.